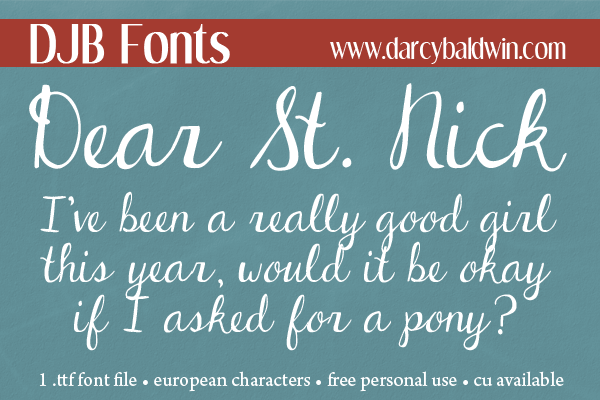 DJB Dear St. Nick is not really a “Christmas” font, per se, but it sure reminds me of an awesome newsletter font just for those special newsletters you always send out at the end of the year! If you’d like something even more holiday and decorative, try DJB Dear Mr. Claus. If you would like to use this for your commercial/professional ventures, please purchase a commercial use license here. For your records, be sure to include the name of the font you are purchasing the license for. Alternatively, if you don’t want to use Paypal, you can purchase it at Creative Market or get the WEBFONT here at FontSpring.